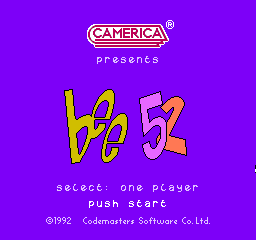 Nucleo: Okay, class, today we're going to review an NES game called "Bee 52". This will be the first review we've done for FlyingOmelette.com, so let's get started. 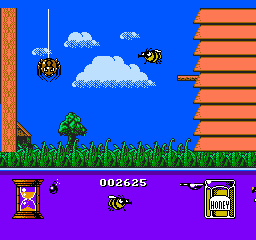 Christopher: Bee 52 is an unlicensed NES game made by Codemasters and published by Camerica. 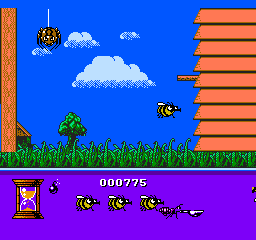 In it, you play as a really fat bumblebee (lol!) that flies around a garden looking for flowers to pollinate while avoiding all the nasty little spiders, insects, and water fountains that get in your way. Chester: Dude! Awesome! 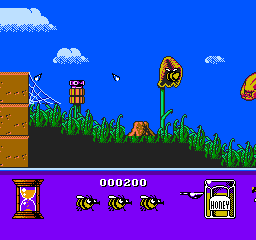 I've always wanted to be a bee. Christopher: Yes, it's a highly-original and innovative concept. 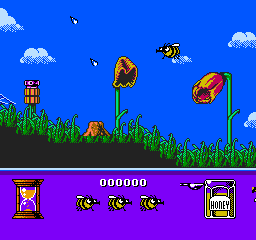 Nicolas Cage: Oh no, not the bees...NOT THE BEEEEES!!! The goal is to collect enough honey from the flowers to fill your jar. Chester: And dude, you have to like, destroy all the ants so that they don't try to steal your honey. Yup! 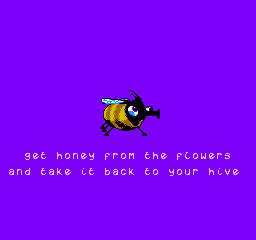 If you take too long, they show up in your subscreen and start taking your honey away. So, make sure you kill them all before that happens. Nicolas Cage: This is murder! You'll all be guilty! Killing the ants won't bring back your GODDAMNED HONEY!! Chester: Dude! Whoah! That bee's really gettin' it on with that flower! Nicolas Cage: My eyes!! MY EYES!! ARRRRRRGGHGHHGH!! Chris: ROFL! It's all about the birds and the bees! Chester: So, dude, this game is like...educational and stuff? Christopher: That's right! We learned that honey comes from flowers...and so do babies! Chester: Dude! That explains so much! ...I think. Nucleo: Okay, class, well I think it's time you just gave your scores. Christopher: Score? I don't know. I didn't get past the first level. Chester: Dude, I give it a 23. Nicolas Cage: How'd it get burned?...How'd it get burned?! HOW'D IT GET BURNED?! HOW'D IT GET BURNED?! Chester: Dude, allright, allright, a 24-1/2, but no higher. GO BACK TO THE RAU GRAND FINALE?